Sunbury is making plans for its 2015 Independence Day celebration. On Saturday, July 4, folks from all over the Big Walnut area will gather in Sunbury for the celebration. The day begins early, with a 7 a.m. to 3 p.m. antiques, arts & crafts fair on the village square. The Sunbury/Big Walnut Area Chamber of Commerce sponsors the fair. The 2015 Big Walnut 5K Freedom Walk/Run will start and end on Sunbury Square. Registration begins at 6:30 a.m.; the race begins at 7:30 a.m. For more information or to preregister online, go to the Premier Races website at premierraces.com. At 9 a.m., the 16th annual Corey Lehman Memorial Volleyball Tournament gets underway at Big Walnut High School. To register for the volleyball tournament, go to the Sunbury/Big Walnut Area Chamber of Commerce website at sunburybigwalnutchamber.com. At 9:30 a.m., children with decorated bikes and tricycles will gather at the southwest corner of Granville and Columbus streets for judging and then enter the parade as it goes by. Sunbury’s 10 a.m. 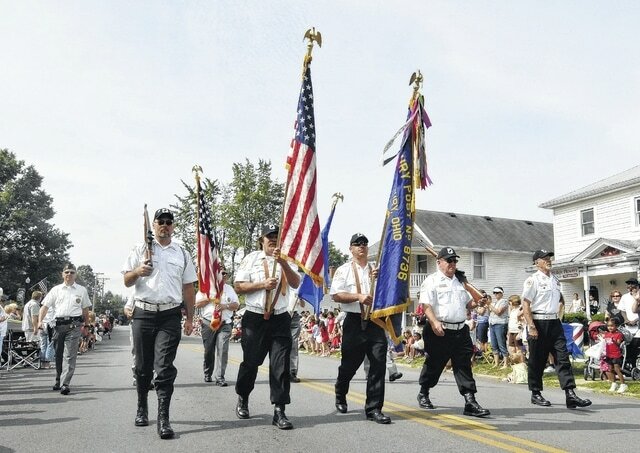 Independence Day parade, titled “Star Spangled Salute,” will honor Vietnam era veterans, escorted by the 122nd Army Band of the Ohio Army National Guard. Vietnam era veterans who wish to be in the parade are encouraged to contact Donna Evans via email at memadonna9@yahoo.com. To register a float for the parade, go to sunburybigwalnutchamber.com. As the parade passes the announcer’s stand, each veteran will receive a mayoral proclamation of appreciation from Sunbury Mayor Tommy Hatfield, and a governor’s proclamation for each veteran from Gov. John Kasich. Evans said Vietnam veterans do not have to be from Sunbury or the Big Walnut area to join the parade and be recognized. The Columbus Saints Drum & Bugle Corps will perform on Sunbury Square immediately after the parade; and an 11:30 to 1:30 community cookout will be hosted by Wayne Miller, Eagle Auto Repair and the chamber. For children age 10 and under, there will be a “KidZone” on the square. The 1 to 3 p.m. KidZone will feature a free bounce house, games and more. Adults must accompany children; adults must pay the $1 square admission charge. After the parade, at about 11 a.m., a football skills punt, pass and kick contest will be hosted by members of the Big Walnut Youth Athletic Association at JR Smith Park. Sign-ups for the association’s 2015 football season will be held until 2 p.m. at the park. Youth football registration will remain open until July 6. Go to the association website at bwyaa.com for more information. Activities move to Big Walnut High School for the 6 to 10 p.m. community party and July Fourth fireworks show at about 10 p.m.
For more information about the celebration, contact the chamber at 740-965-2860.